The Zhiyun Z1 Rider 2 is a wearable steady-cam gimbal system for Go Pro cameras. Gimbals are fast becoming the most practical, simple and affordable solution for shooting super stable video footage. Even slow shutter speed, hand held (night) shots and the Z1 Rider 2 is no exception. I love shooting video and have always been fascinated by camera stabilisation techniques. When I first bought the Sony PMW EX1 in 2008, I also bought a complete steady cam system for it. This consisted of a large vest, a steel swing arm frame and a heavily weighted monopod to wear on the end. It worked nicely but it was such a pain to put on and carry around. Since then, stabilisation for video cameras has boomed. It has been helped along, I am sure, by the comparable progression of drones (or UAV’s) with video cameras. Having gone from the DJI Phantom 2 drone with HD 3D 3-axis gimbal to the Inspire 1 with Zenmuse 3-axis systems, I was happy to receive the Z1 Rider 2 through the post for review. I had read a lot about it and seen other videos online so was keen to try it out. The beauty of the Z1 Rider 2 is that is can be worn or used anywhere that you can put a Go Pro. It has the standard Go Pro attachment on its base which is great. It also has the standard tripod 1/4"mount at the base of the handle meaning you can use it static on your tripod or anywhere with that mount. This opens up numerous possibilities for filming with the Z1 Rider 2. 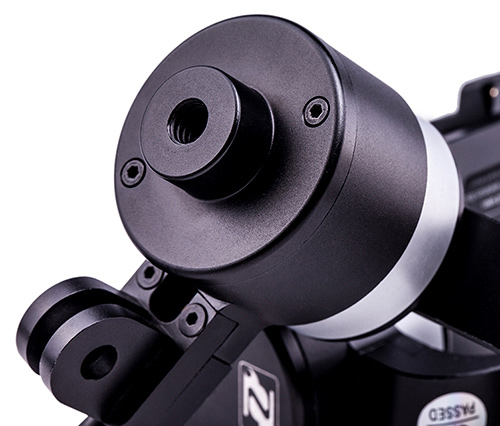 The Z1 Rider 2 has a 3-axis gimbal which gives incredibly smooth footage even at high speeds. At 50mph or so, I was able to film a totally level and perfectly still horizon as the bike jumped about below me. It also worked very well on the ski slopes using both the chest mount and pole. The handle is unattached from the main gimbal. This gives you the freedom to control the gimbals’ movements from a short distance. It is especially useful for correcting misaligned horizons as well as tilting up and down to follow your subject. Number 1, heading follow mode is the most used for myself but I can see the other two modes being useful. In particular mode 3 when filming a static subject like a live concert. It is stated that the Z1 Rider 2 will operate for around 4 hours using the 2 supplied batteries which is pretty good. The Go Pro only runs for around an hour or so using the standard Go Pro battery. Therefore, users will love the fact that you can power the Go Pro from the Z1 Rider 2 handle using a supplied cable. Cool! Overall, the Z1 Rider 2 is a fine piece of kit and works well in most situations. I did find that the horizon would become misaligned after a sharp turn on the bike or in the car but it corrected itself over time. Of course, you can also correct it simply and quickly using the handle adjustments. I would say the Z1 Rider 2 is a great buy for Go Pro video enthusiasts and even professionals. The Go Pro already produces superb footage and the Z1 simply makes it better. The Z1 faces competition from the Feiyu-Tech G3 and G4 Ultra units. However, for me the flexibility of the Z1 wins hands down. The DJI Osmo is also very stiff competition to the Z1 but at nearly 3 times the cost, you have to weigh up the pros and cons and decide which fits your purpose best. You can buy the Z1 Rider 2 from Amazon using the links below. Please bear in mind we receive a small kickback from Amazon which helps this site running and you don't pay any extra. A highly recommended bit of kit!